I’ve just delivered a very different workshop from usual, and I really enjoyed it. I based it on the teachings of Saint Teresa of Avila (151-1582) -and her little book with a huge message: the ‘Interior Castle’ written in 1577. Persuaded to write by her confessor, this robust diminutive Carmelite nun changed the history of her time, by becoming one of the only women in a Holy Order to write books in her native language, teaching how to pray, and that it is possible to reach the Divine within ourselves. Posthumously given the title of Dr of the Church, as well as a Saint she has been honoured in modern times yet troubling the authorities as an ‘enigma’ during her life time. Now if any of you are familiar with the dates I’ve mentioned you’ll know this was the time of the Spanish Inquisition. A time where women were not considered spiritual enough (so they often starved themselves so that they had no outward appearance of being female) they were not allowed to teach and certainly not write. Her grandparents were jewish, and so her father had turned to Christianity and became a successful merchant. Jews were being expelled from the country or worse (unless they recanted and became Roman Catholic), and it was with this prohibitive atmosphere that she not only wrote and taught, but in her lifetime completely reformed the monastic order throughout Spain. Teresa of Avila saw angels. She troubled her confessors (and the Inquisitors) because had visions of Christ, was seen to levitate during meditation, and was found in trance sometimes for hours. Yet her love of food and music earned her a reputation which was a far cry from the usual pious and frugal convent nature. 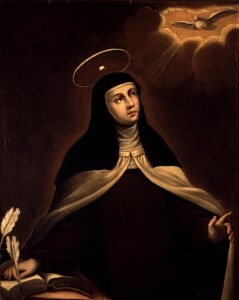 Teresa was certainly one of the leading mystics of the Middle Ages. Her prayers, lessons and descriptions of the spiritual life are ageless, and as meaningful now as they were to her followers nearly five centuries ago. Teresa had a vision, in her meditation, of a beautiful clear crystal ball and within it were seven mansions with many rooms. She saw it as a castle and understood that his was representative of our human soul and the internal spiritual journey to find God within. The Interior Castle introduces us to a deep and beautiful spiritual practice which leads to our centre, and the secrets of our soul. To find it we have to make the decision to take a deep breath and cross the drawbridge where as we enter the first mansion we will meet all sorts of temptations which she calls ‘reptiles’. Each mansion has a different lesson and along the journey we may make our own choices as to which of the many rooms we choose until we leave that mansion and move along to the next. Eventually we will reach the inner mansion and greet our soul, where God resides. It’s a beautiful journey during which we learn humility, about facing our deepest shadows, that God is in the details, the importance of spiritual friends, and most importantly the benefit of prayer. It was such a pleasure to revisit the life of this wonderfully inspiring tiny Spanish woman. During my degree course I was asked to write a personal study of 10, 000 words about the powerful interplay between her as a woman and the church authorities. For me as a student of religion and particularly mysticism the message of St Teresa’s life and work provided a few answers to some of the questions I had about mysticism, not just about aspects of gender studies. I so love it when I explore an idea and find that it leads me to an exciting and intricate piece of the great mystical puzzle of the spiritual life. Thanks to the interest of one of my own students in Ireland who encouraged me to devise this workshop, I’ve revisited the life of this wonderful woman with a fresh lens and deeper understanding.